Railing against corruption, young people across the country are standing up for a more just future. On June 12, anti-corruption protests—the largest anti-government rallies in five years—took place in 224 cities across Russia. Most striking is how young many of the protesters were. A monitoring group said at least 850 people were detained in Moscow alone, and independent media outlets reported about 1,700 detained nationally, among them 136 teenagers in Moscow and St. Petersburg. On YouTube, opposition leader Alexey Navalny called on “all patriots,” regardless of their political affiliations, to take part in protests against corruption. Many activist groups did receive official permission for their actions; those who did not planned unsanctioned events. Since March Navalny has been traveling across the country, agitating and facing pressure from regional and local authorities and pro-government groups. (Earlier this year, he was attacked and almost lost his eye.) It was clear that he was starting his own run for the March 2018 president elections. At the same time, many pro-government media outlets launched campaigns against involving young people in the protests, against Navalny, and against critical voices in general. School teachers and university administrations warned students not to protest and threatened sanctions against those who did attend. The June 12 protests took place against a backdrop of other protests against corruption and for accountability. Protesters are confronting the Moscow Mayor’s plan to “ renovate” 1960s-era housing—so called “khrushchevki” (affordable apartment buildings named after former-Soviet leader Nikita Khrushchev, who launched a campaign of affordable housing in the 1960s). Owners of these apartments understandably see in this decision a threat to their property and constitutional rights, and last month thousands of Muscovites protested, marching from the State Duma to the Kremlin. Many angry citizens joined this march, demanding the dismissal of Moscow Mayor Sobyanin. A Change.org gathered signatures for this action, as well as for one in St. Petersburg in which people protested the city’s decision to transfer St. Isaac’s, the main cathedral of St. Petersburg, into the hands of the Russian Orthodox Church. And thousands of truck drivers and car owners nationwide are protesting what they perceive to be an unjust and corrupt new road tax system called “Platon.” Protesters are seeking accountability and demanding that the authorities consult with them before making a decision. By June 12, Moscow’s anti-corruption event had been approved by city authorities to take place on Sakharov Prospect. But, the night before, Navalny changed the location and, via the Internet, called on people to go to Tverskaya Street in downtown Moscow, several hundred yards from the Kremlin, to crash a massive street festival of historical reenactments staged for the official Russia Day state holiday. He was detained at his apartment building entrance and was, according to the independent Meduza news agency, was sentenced to 30 days for defying authorities and refusing to protest at an approved location. Protesters on the streets, demonstrating with national flags, mixed on Tverskaya with strolling families coming to official celebration performances, and picturesque participants of “historical reconstruction” in the costumes of medieval knights, Red Army soldiers of the Second World War, or KGB officers. Police units were waiting, and quickly started detaining protesters. Kremlin spokesperson Dmitry Peskov called the June 12 rally an “act of provocation.” Human-rights leader Lev Ponomarev said that Navalny, by changing the location of the event, “made a provocation” and may have discredited the human-rights movement as a whole. Opposition parties Yabloko and PARNAS decided not to participate in Navalny’s initiative. The most interesting development in the recent protests is the motivation of people and their priorities. According to the independent news agency Echo Moscow’s poll, 89 percent of participants went to raise their voices against corruption, 6 percent went to support Navalny, and 2 percent could not identify their reason for attending. The majority were young people, even teenagers. Observers say that people’s faces on the streets on June 12 were very different from the faces of protesters of previous years. They look like their children or even grandchildren. It is the generation born after the end of the USSR, a generation that does not remember any other leader but Putin appearing on TV. It is also, according to polls, a generation which is the strongest supporter of Putin. They like the idea of a powerful country, of a strong president, who stands up to world leaders and has his own vision. They would like to be proud of their country. There is no doubt, many of them would support Putin if he runs in 2018. But Putin for them is mostly a symbol. They like the symbol, but many do not like the practical realities of Putinism. This generation does not have fear, unlike its parents or grandparents. That is very important. The famous blogger Anton Nosik wrote that these young people had, for example, no experience being detained for reading Alexander Solzhenitsyn in late Soviet time. They are fed up with everyday lies and hypocrisy and attempts to restrict their lives and voices in their schools and universities. They hate corruption and stupidity in their native towns and cities, and in their everyday life. 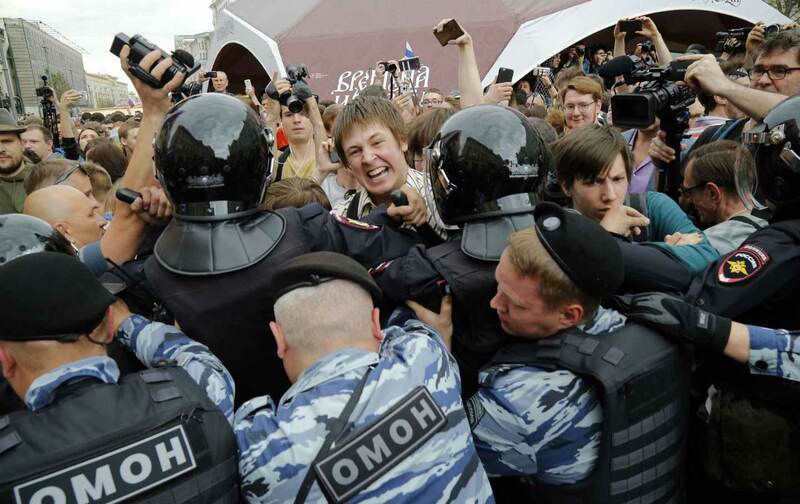 Journalist and film director Andrey Loshak wrote about the fresh anger of the young, and argued that the June protests were a bad sign for power, and a very good sign for the rest. “The country is divided, without clear prospects, many people detained—that is how we met Day of Russia in 2017,” wrote opposition party Yabloko’s founder Grigory Yavlinsky, and called on authorities to release everyone detained. In the summer of 1988, the acclaimed Russian investigative journalist Yury Shchekochikhin published a seminal article in Literary Gazeta, a glasnost newspaper of Gorbachev’s perestroika era. The article, “The Lion Has Jumped,” was perhaps the first analysis of the mafia and corruption in the USSR. People believed that only the end of corruption would lead the country to undertake a healthy and democratic development. It was one of the main ideas of those years. Shchekochikhin died in 2003 in strange circumstances in the middle of his investigative reporting on the corruption of top-level law-enforcement and intelligence personnel. His death, and the deaths of many fighters—especially journalists—against this chronic disease of Russian society, have not been investigated properly. Just before the June 12 anti-corruptions rallies, Nobel Prize winner Russian/Belorussian writer Svetlana Alexievich came to Moscow to give a lecture at the Gogol Center. It was her first visit since receiving the award. She talked about the power of words, and the power of human dignity in all circumstances, and the power of resistance to slavery and to the fear in people’s souls. She also spoke about personal choice, what makes us human beings and what makes a difference in political and public life. I was amazed that night by how many young people came to the lecture and asked questions about life and fate, history and civil duty. I felt like in my own youth in the ’90s, when we all believed in a better future for Russia and sisterhood with all in our joined efforts to make this world better. And it gave me hope.